Stuff Your Stockings with Music! There’s nothing better than to take down that stocking on Christmas morning to find it filled with chocolate, gift cards, AND MUSIC! Your favorite bands have new recordings just in time for holiday giving. North Shore Polka features Ted on Polish vocals. “When performed live, it gets the crowd going,” Ted said. Rock and Roll Waltz is a classic waltz originally performed by Kay Starr, featuring Mollie's vocal talents on this fan favorite. Schneider Polka is a Six Fat Dutchmen number performed on two trumpets and sax, plus accordion, bass, and drums. A Ja Sam, a Czech song from the old country, is performed the Texas way, including dueling saxes, an accordion solo with a Tejano flair, guitar fills, and “even the ‘whoo, whoo, whoo’ influenced by our Texas friends,” Mollie said. Crazy, a lighter ballad sung by Mollie with unique accordion and piano work by Ted, is performed in a jazz ballad style. El Rio Drive is a Verne Meisner number with a SqueezeBox twist including "soft-shoe" and Latin sections. Waltz of the Angels, is one of the band's most requested waltzes. My Heart Skips A Beat is a Buck Owens number played with a groovin’ Cajun beat. Beer Mug Polka is one of the standards SqueezeBox plays to get the crowd going. Edelweiss is a vocal/piano ballad, sung in English and German. You will hear Mollie's classical training in this song. Red Apples Polka is the band’s version of a hoolerie – Dutchmen-style song featuring the clarinet. Polish Boyfriend Polka is one of Mollie's signature songs. The Rose, is a ballad featuring Mollie. Barbara Polka, is a traditional Czech number featuring the button box. This new CD is the third recording for the band. Freshly Squeezed (2009) contains 20 songs including 14 polkas, 2 waltzes, and 4 fox trots/two-steps with vocals in English, German, Polish, and Czech. 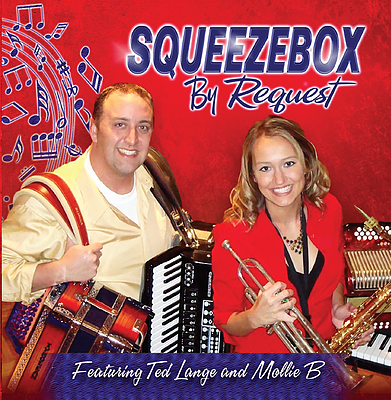 Squeeze Me (2007) contains 16 songs including 8 polkas, 2 waltzes, and 6 fox-trots/two-steps/slow songs with vocals in English, German, Polish, and Czech. 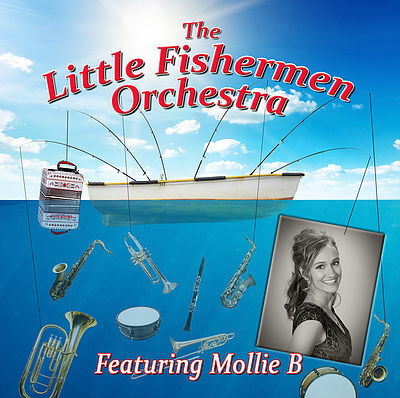 In addition to the By Request CD, Mollie B has released two other CDs - Little Fishermen Orchestra featuring Mollie B has 25 songs performed in Dutchmen and Big Band style, and Mollie B Live with Kenny, Tony, and Dana has 14 songs performed live on the Mollie B Polka Party, taped in Ennis earlier this year. The Little Fishermen CD tracks: It’s a Small World, Midnight Waltz, Sweet Nearness of You, Elmdale Waltz, Aunt Ella’s Polka, Waltz Medley (Four in the Morning/Tennessee Waltz), Rainbow Valley Polka, Homecoming Waltz, Paper Roses, Matilda Polka, Edelweiss, Blue Eyes Crying in the Rain, Silk Skirt Waltz, Red Raven Polka, Invisible Tears, Fritzie Polka, Snow Waltz, Stranger on the Shore, Ellen Polka, Foundling Waltz, Please Release Me, Innocence Waltz, Yellow Rose of Texas, Little Fishermen’s Waltz, and Sauerkraut Polka. 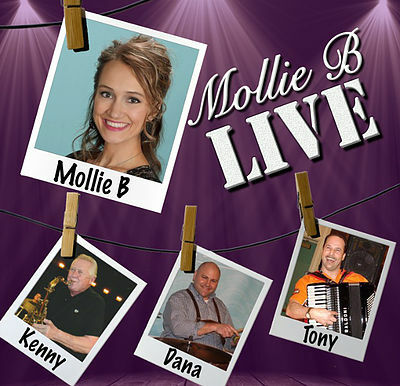 Mollie B Live features Mollie on vocals, trumpet, sax, and keyboard; Kenny Brandt on sax; Tony Sabo on accordion, midi bass; and Dana Lindblad on drums. Tracks: Beer Barrel Polka, Praha Polka, Tick-Tock Polka, Slap Happy Polka, Pennsylvania Polka, Rock Around the Clock, Mozart's Polka, Save the Last Dance for Me, I Fall to Pieces, Kramer's Polka, Marie Augie's Polka, Memories of Vienna, and Quick Stop Polka. Order yours today! Mollie is also offering a special discount to Texas Polka News and polkabeat.com fans. on her Christmas Special DVDs/CDs. She has four DVD/CD packs available. When you buy 3 packs TPN/polkabeat fans get a $5 discount; $10 when you buy 4. Shop now and be sure to type in TPN in the PayPal message section. Mollie will send you the discount via PayPal. This CD has the classics and original tunes to make you feel like you’re at a Cajun polka party. In addition to Cajun standbys like Jole Blon, Jambalaya, and Diggy Liggy Lo, the CD features three original tunes – Cajun Baby’s Cookin’ Tonight, written by Daniel Klapuch (who co-penned Moon Over Moravia), Going to Hallettsville, written by Daniel and Chris, and Love that Chicken From Popeyes, written by Chris. Inspiration came for the latter tune after Chris and his band performed for a party at the Popeyes headquarters in New Orleans. In addition to Chris on accordion, keyboard, and vocals, the CD features Bonnie Riley on fiddle, Jonathan Statsky on rubboard and vocals, Marvin Kremling on maracas and vocals, Ronnie Hermes on guitar and vocals, and Edita Rybak on vocals. Available in the Polka On! Store or send $18 (includes shipping) to Chris Rybak 603 N Texana, Hallettsville, TX 77964. This CD features six polkas, six waltzes (including a beautiful rendition of Waltz of the Angels), the classic Spanish Eyes, and two country tunes, including Take Me Home Country Roads (John Denver is smiling). The band was started in 2009, and this is the group’s second CD. Current band members consist of seven college students, five being proud Fightin’ Texas Aggies (Whoop!). The band enjoys taking trips to play in new places and looks forward to spreading the joy of polka music for many years to come. Band members: Matthew Matous (accordion, trumpet, sax, vocals), Chris Trojacek (accordion, guitar, trumpet, sax, vocals), Adam Rejcek, drums, vocals, Josh Goodwin, tuba, bass, Zachary Matous (keyboard, bass) Phillip Cryer (sax, guitar, vocals), Tyler Prasifka (trumpet, vocals). The band's first CD, Czech Spirit Will Live On, is also available at the band website and the Polka On! Store. 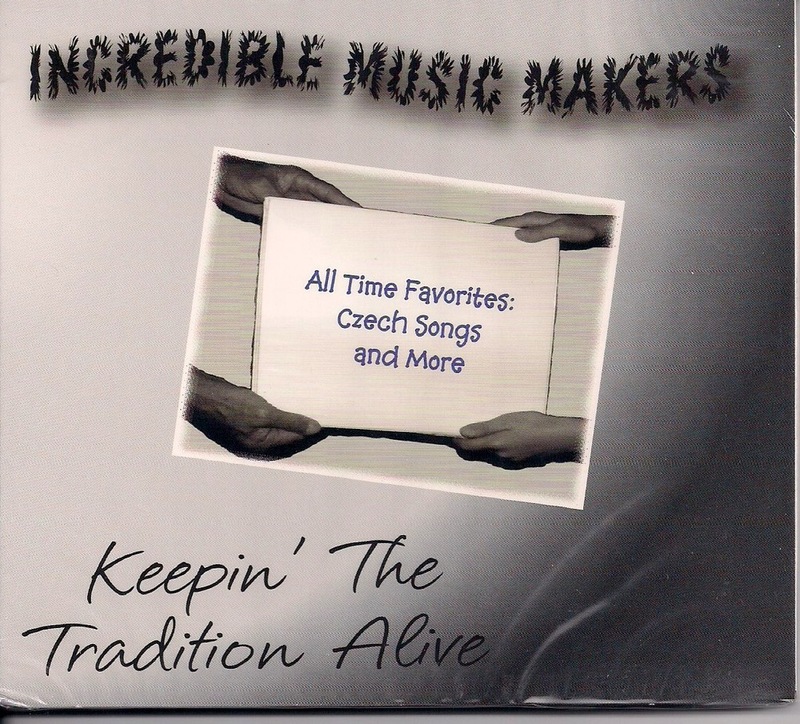 This CD is pure polka and waltz music, featuring 11 polkas, including Long Road to Praha, Gypsy, Music, Music, and Peanuts, and five waltzes such as the beautiful Dreamland Waltz and Owl Waltz. In the liner notes, ECB says, “It seems like yesterday we went from three guys in a garage to now eight guys having the opportunity to perform at some of the best events for the greatest people you’ll find anywhere.” Band members: Chris Trojacek (vocals, tenor sax, trumpet), Corey Mikula (drums), Frank Vrla III (tenor sax, guitar, trumpet) Jared Prachyl (bass, vocals), Jerry Petter (accordion), Michael Trojacek (alto/tenor sax, vocals), Trey Sylvester (keyboard, vocals), and Zeke Martinez (rhythm guitar). Available in the Polka On! Store or send $18 (includes shipping) to Trey Sylvester 2392 Intrepid Dr., Buda, TX 78610. This CD is non-stop polka party fun! John and Mark have selected 20 great tunes to celebrate their 30 years in the polka party business. The CD features 11 polkas, including Church Picnic Polka, written by Donnie Hons, If I Were a Bird, Tick-Tock, Seven Step, and Hey Baby Que Paso, written by Augie Meyers; five waltzes, including the beautiful Katherine’s Waltz, written by Jason Keepers, Westphalia, and a waltz medley with Looking for my Sweetheart and At the Spring; three country tunes – Dark Lighted Barrooms, The Chair, and Make the World Go Away; and the fun Santa Bring Me a Tuba, written by Daniel Klapuch. Available in the Polka On! Store or send $19 (includes shipping) to John Dujka 3384 Success Dr Brenham, TX 77833. If you love brass in your polka, then this is the CD for you. The band has always strived to emulate the classic brass band sound of such beloved Texas bands as the Bacova Ceska Kapela, Adolph Pavlas, and the Joe Patek and Lee Roy Matocha Orchestras. The CD features eight polkas, including Prune Dumplings, Wooden Heart, and No Beer Today; and eight waltzes, including My Darling, Rosalinda, and Waiting in the Woods. The Red and White Waltz is the arrangement as originally recorded by Baca's Ceska Kapela from their first recording session in 1929 at Okeh Records in San Antonio. The band is anchored by original members Dennis Svatek (lead trumpet, lead vocals and music arranger), Dave Bedrich (trumpet and vocals) and Thomas Durnin (stand up bass). The sound is rounded out with Frances Barton on accordion, Rob Schmidt on drums, and their newest member, Dennis’ son, Stephen Svatek on baritone and guitar (when he’s not playing with the UT marching band). Czech out the band’s website – czechpolka.com – where you’ll find the world's longest running polka podcast, since 1998!Dennis uploads new shows every two weeks, plus you’ll find 68 archived shows, for over 176 hours of free music! CD available in the Polka On! Store or send $18 (includes shipping) to Dennis Svatek 2100 Mildred Dr. Taylor, TX 76574. This is the group’s first CD providing a mixture of cover tunes with some originals written by bandleader Joe Klaus. Tunes include Paint It Black (yes, Rolling Stones), which Joe converted to a polka after sitting with a rock band from Austin; Polka Medley, with some of the group’s favorite German and Czech tunes; Cortina, named after Lake Cortina in Northern Italy, which Joe was inspired by the beauty of the lake surrounded by the Italian Alps while on a boat ride; Paula's Cuckoo Waltz, an original tune written for Paula Kager from the Kuckucknest German Store in Fredericksburg; No Beer Today, no explanation needed; Baumerwald, features Joey Schwab on baritone; In Heaven There Is No Beer- sung in English, German, and Spanish, with some Polish la-las thrown in; Ooh La La, an adaptation of a Rocking Sidney Zydeco tune; and Swingtown, a polka version of the Steve Miller rock tune, a OTG favorite and one of their most requested tunes. Available in the Polka On! Store or send $18 (includes shipping) to Mike Campasso 8100 Manassas Dr. Austin, TX 78745. Expand your music search to polkaconnection.com where you’ll find simply the best collection of fine polka music from around the world. Owner and musician Chuck Stastny has been collecting this fine polka music for 25 years, 10 years on the web. His catalog now features 2,500 different CDs and DVDs for sale, and the website has over 34,000 song samples. "We've provided all the best high-quality polka classics, along with the newest artists for your listening pleasure," said Chuck, who has been loving the music since age 0. “Grandpa played the button box and mom played piano accordion.” He invites you to browse the catalog of more than 2,500 titles, listen to samples, and buy online and pay no domestic shipping. The Red Ravens' latest CD, Playin' Ole Classics, was chosen as the Best Czech CD in 2013 by polka fans across the nation. The voting took place on the Polka America Corporation (PAC) website in March. So, not only do we have a Czech winner, it's from a Texas band! Yay! I look forward to presenting the trophy to the Red Ravens in the next month or so. And BTW: the Red Ravens CD is available in the Polka On! Store! 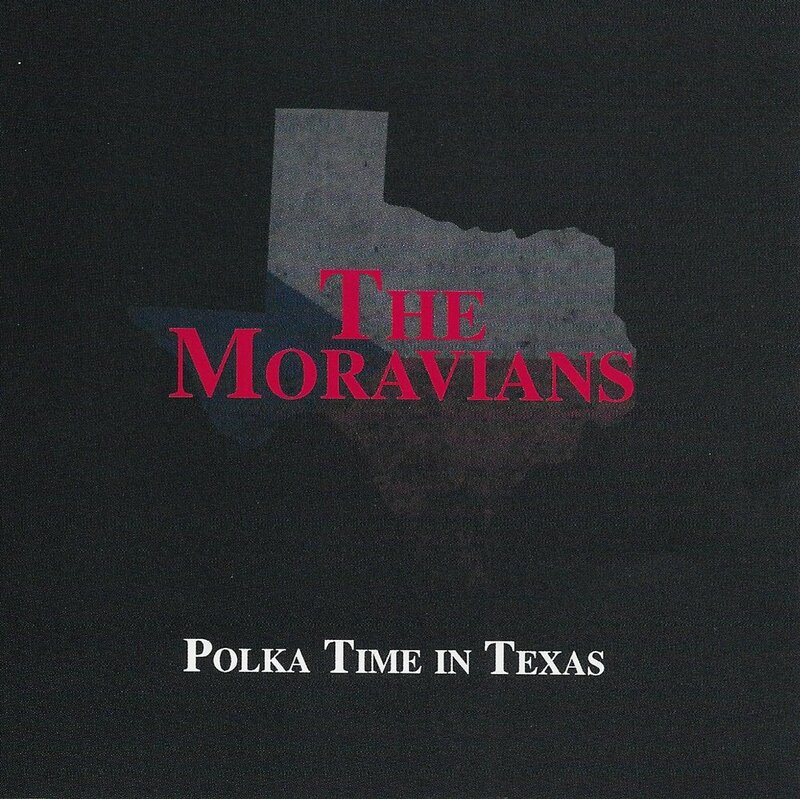 Several Texas polka bands introduced new recordings at the end of the year. Chances are you got one for Christmas. If you didn’t, they are now available online in the Polka On Store. To celebrate National Polka Month, all January orders will receive a free polka bumper sticker. 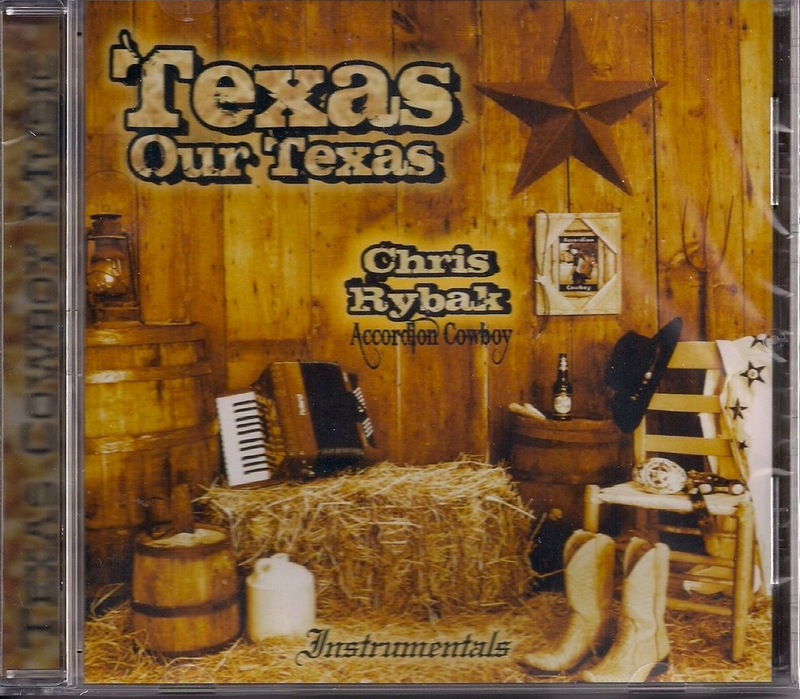 If you’re a proud Texan (and who isn’t) you will want this CD for your collection. Chris said he’s proud to be a Texan and wanted to bring the feeling and flavor of Texas to everyone through music. There are 14 great tunes. “These songs have always been my favorites. I wanted to include songs of the Wild West, some campfire songs, the state song ‘Texas Our Texas’ and two college fight songs for UT and Aggies,” Chris said. The CD is pure music. No vocals. Chris spent six months working on the music, playing all the parts of each piece. “I wanted to focus on the instruments. I wanted people to feel the music,” he said. My faves are The Yellow Rose of Texas, Waltz Across Texas, Red Rive Valley and Cotton-Eyed Joe. Sorry, as a University of Houston grad, I can't endorse the UT and Aggie fight songs, although they are classic. The drought is over, at least for new Red Raven music. It has been five long years since the guys’ last CD Polka Cruisin’. Enjoy 17 songs, including my faves Little Goose Polka, Muziky Muziky Polka, Katherine’s Waltz and Chappell Hill Special. Red Raven Shane Lala said you won’t find any of these tunes on their other CDs. “We produce a new song list every time we record,” he said. 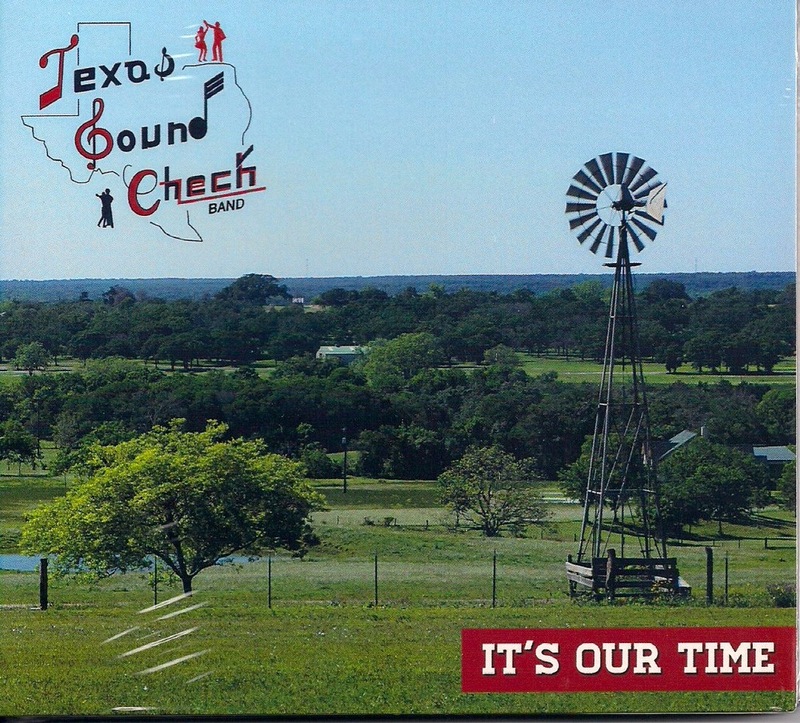 Another long time in coming is a new CD by Texas Sound Check. The group made a list of 200 possible tunes to record and whittled it down to 24. Maybe that’s why it took so long :-) It was worth the wait. Band Leader Benny Okruhlik and this group of musicians have been playing together for a few years and they decided it was time to record, hence the CD title It's Our Time. My faves: Amerika Polka, Mountain Valley Waltz, Dreamboat Waltz and Polka Celebration. Lots of great polka party songs on this CD, including my faves No Beer Today, In Heaven There Is No Beer, Corn Cockle and Beer Barrel polkas and great waltzes like Westphalia and Blue Skirt. This group bills itself as Austin’s Only Authentic Czech Polka Band. Thomas Durnin, the group’s bass player, has a show called Czech Melody Time on KOOP 91.7 FM in Austin every Sunday from 9-10 AM. Trumpet player Dennis Svatek also produces a 90-minute Internet radio show each month called, appropriately enough, The Polka Show, which features Dobre Muziky. Shop now! Remember proceeds from the Polka On Store allow polkabeat.com to reinvest in the polka community by sponsoring festivals, dances and bands.